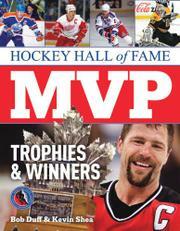 A vibrant introduction to the stars of professional hockey’s firmament. Professional hockey dishes out more annual awards than any other sport, or at least it seems that way: highest scorer, best goalie, most valuable player as voted on by the players, most sportsmanlike, most valuable player in the playoffs and the highly esteemed Hart Trophy, given to “the most valuable player to his team,” though only one player in the whole league is chosen. Duff and Shea provide a thorough background for a handful of these awards—they have gone through any number of name changes and trophy models—and all the controversies and close calls. They then provide short biographies and crisp photos of the winners of the three principal trophies—there are enough action shots to make readers want to hit the pond for a little shinny. Occasionally the authors are reduced to clichés—“Montreal’s fiery right-winger with a nose for the net showed his doubters he was the real deal” (many will wonder exactly who Maurice “the Rocket” Richard’s doubters were) or hackneyed quotes. In general, though, the tone is enthusiastic, and the book runneth over with facts and lore.